in the HESS (High Energy Stereoscopic System) array, located in Namibia. This array uses four of these Imaging Atmospheric Cherenkov Telescopes (IACTs), which detect the flashes of Cherenkov radiation produced as high-energy gamma rays and cosmic rays hit the Earth’s atmosphere. 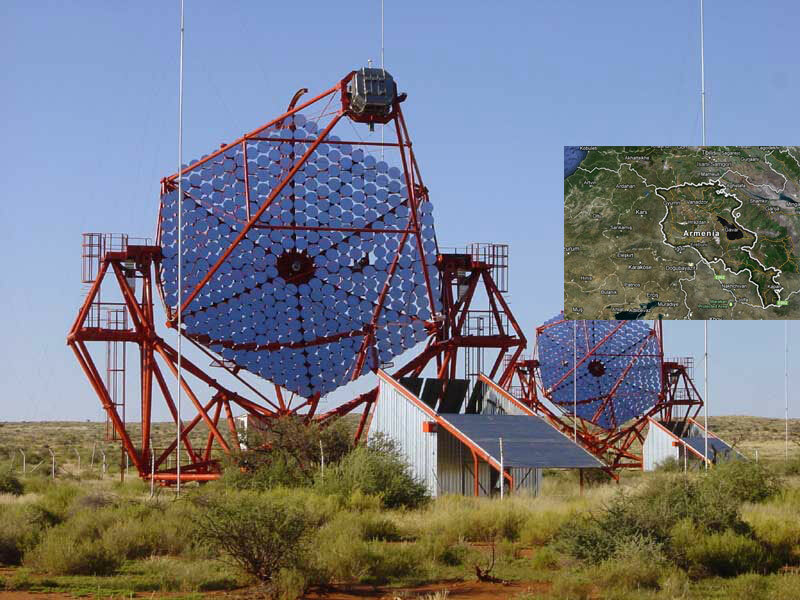 The HESS array is used to investigate gamma ray sources such as supernova remnants and pulsars. The telescopes use hundreds of mirrors (round), each 60 centimetres in diameter and made of aluminised glass with a silica coating. The HESS array has been operational since December 2003. The telescope structure and its drive system were designed by engineers in Germany and South Africa, and produced in Namibia and Germany. The 875 hexagonal mirror facets which make up the huge reflector were manufactured in Armenia, and individually characterized in Germany. The mirror alignment system results from a cooperation of German and Polish institutes. The camera, with its integrated electronics, was designed and built in France. The construction of the new H.E.S.S. II telescope was driven and financed largely by German and French institutions, with significant contributions from Austria, Poland, South Africa and Sweden.